With the creation of the Human Legion came the need for new uniform designs to reinforce the split from the Navy and Human Marine Corps organizations who had pledged unceasing loyalty to the White Knight Empire. Given the iconic look of Human Legion uniforms today, it is surprising to learn that their design was regarded as a minor detail barely worth a mention in the written record of that time. White and cream were the colors of the old White Knight regime and its loyalists. Red was the color of the rebel faction in the civil war, including the so-called ‘Free Corps’ Marine units. In a war waged over hundreds of light years, and that employed technology still barely comprehensible to humanity, it is strange to think how significant these colors came to be as a rallying call for each faction. The political position of the early Legion was to be belligerently neutral in the civil war. Not wishing to use the colors of either faction, the Legion reprogramed its smartfabric fatigue uniforms to be all black. That day is still to come, and with its all-black uniforms such an instantly recognizable symbol of the Legion, the day will not come soon. 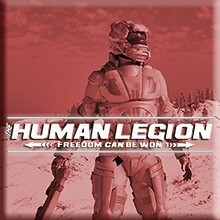 The earliest Legion uniforms – those used in the First Tranquility Campaign – had no need for unit or service insignia, so small was the Legion’s size at the time. Even rank was not initially shown on the uniform. The only distinction was that Marine uniforms had subtle bronze facings, while Navy uniforms had silver (being the traditional color to represent the stars). Later uniform designs added rank insignia on epaulettes, service specialism on the collar, unit insignia on the right shoulder (e.g. brigade, fleet, or regiment) and optional tactical recognition flashes on the left (e.g. taskforce, drop zone, or wave). A dress uniform variant was also added; in most cases this was nothing more than a different program for the same smartfabric garments, although woven natural fabric versions have been worn on special occasions. The dress uniform design includes a cloth-effect beret, simulated braid, a high-neck collar, and the appearance of a double-breasted jacket. Centuries after the young Major McEwan’s deferred a proper uniform design, the all-black colors are now spreading from personal uniforms to starship hulls, and vehicles that range across land, sea and air. Whether the sight of these black fleets instills pride or terror in those who see them, one thing is for certain: black is no longer a neutral color.